This is an updated version of an old freeplay quest. It has the same name but different content. There is also a second part to this available to members only. 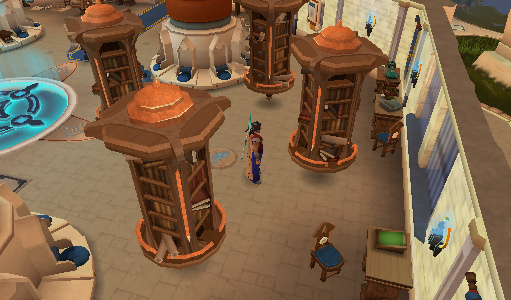 Speak with Ariane in the first floor of Wizard's Tower to get started! This quest is fully voiced. Ariane knows that the Wizards' Tower is under threat but no one wants to believe her. Aid Ariane in her efforts to protect the Wizards' Tower and discover just what's going on. Speak to Ariane at the entrance to the Wizards' Tower. 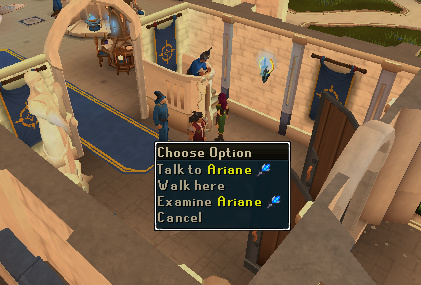 Speak to Ariane in the lobby of Wizard's Tower south of Draynor Village. A conversation between her and Wizard Valina will start. Ariane needs to talk to Archmage Sedridor but will not explain why. She is banned from entering for any reason, but maybe you can help. Ariane will recognize you as the adventurer who helped Xenia and will ask you to help her take a message to Sedridor. 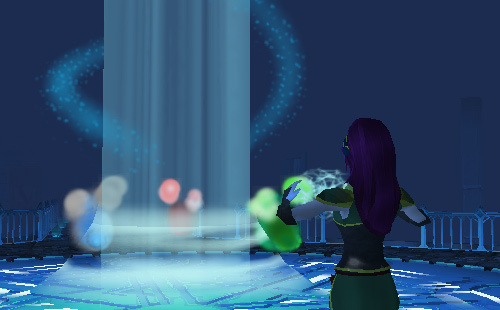 Before she finishes telling you what to do, a cutscene will play showing strange things happening in the tower! Find out what's going on. You will have to cast the air strike spell to lead the red glowing magical vortex on the east side of the room into the blue glowing power beam in the center of the tower's ground floor. 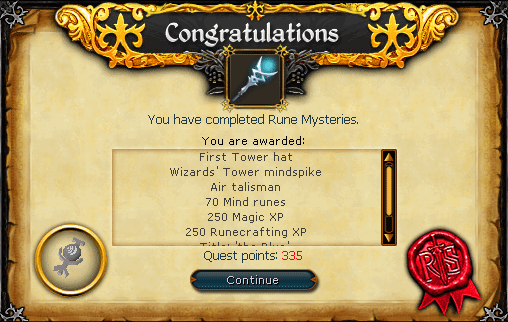 If you do not have the runes for it, you can use Borann's mindspike which he dropped next to him. Equip the mindspike and autocast air strike to lead the magical vortex around the bookcases and to the center of the room. 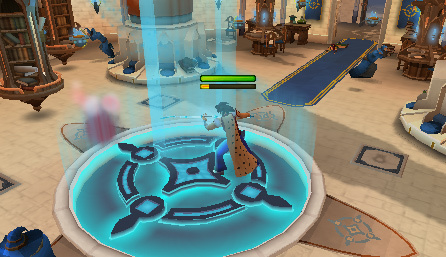 Your spell will create a pull on the vortex so you will have to stand on the beam until it follows you. Speak to Ariane outside the tower when this is completed. You will now have to find out what was going on in the tower by speaking to the wizards. She recommends speaking with Archmage Sedridor and Wizard Ellaron. 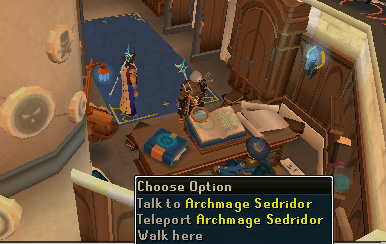 Go up the power beam in the lobby twice and speak to Archmage Sedridor, Wizard Traiborn, and Wizard Ellaron. Traiborn will tell you that he sees "thingummywhats" in the power beams. This tower was built on the ruins of an older tower which is where the magical vortexes are coming from. Tell Sedridor that Ariane believes the tower is in danger, he already knows. Apparently there is no cause for concern because he is already dealing with it. Ask him what he plans on doing. Wizard Ellaron is the most wise on heeding Ariane's warnings and will do whatever he can to convince Sedridor of the danger. You should also speak with the other wizards in the castle for further information. After gathering enough help from these wizards, return to Ariane outside the tower. She will confirm that the underground ruins of the former tower are still there and very much active. Suggest going down and investigating. Ariane will tell you that Archmage Perien sealed the entrance to lower levels, but casting water surge may help. Many wizards have tried with no results but there may be a key hidden somewhere in the tower. Since Wizard Ellaron is the most helpful so far, he will be the one you should talk to. 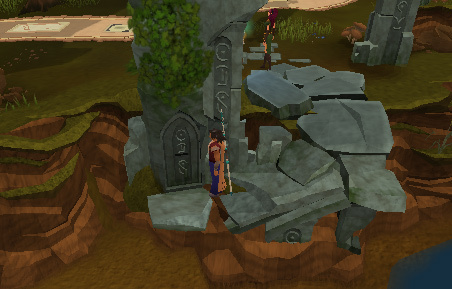 Go back up to Wizard Ellaron and ask him how to access the old ruins. 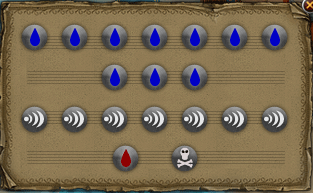 Apparently the concept is not casting the water surge spell, but understanding it. Ask him what he means and he will tell you about a book in the ground floor library on the relation between magic and music. 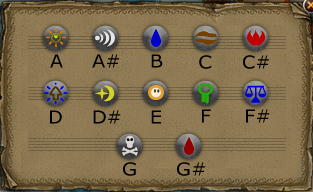 The easternmost floating shelf will contain "The Runes of Water Spells" and "The Harmony of Runes". Right click each to view a diagram. 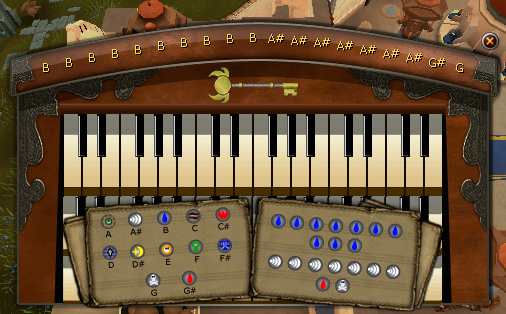 B B B B B B B B B B, A# A# A# A# A# A# A#, G# G.
The key will appear on the keyboard afterward. Return to Ariane and she will tell you that you can access the ruins from the eastern side of the tower. Go outside and to the east and speak to Ariane near the ruins. Click on the door on the side of the ledge to enter and you will go down into an ancient cavern that hasn't been seen in a century! You can either ask Ariane what to do next or inquire about the history of the old ruins. 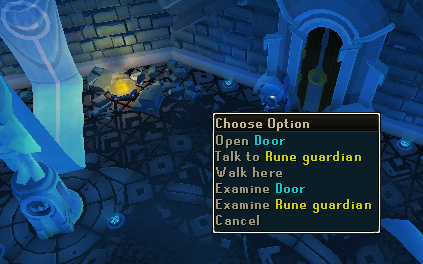 You will find a Rune Guardian blocking the door to the next room. The guardian will think you're wizards trying to join the tower and will give you a test of five questions. The answers that you choose will determine which order you belong to and the guardian will give you an archaic wizard hat and the ability to change your user title to a color that corresponds the order you were put into. The options are Blue, Red, Gray, and Green. If you choose to accept the user title, it will appear as *Username* the *Color*. You may take this test as many times as you want until you get the color you want. After the test, walk through the door behind the guardian. 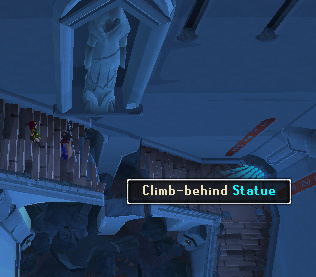 Talk to Ariane and your task will be to find a way to cross the space in the middle of the stairway. On the south wall you will see a statue on the wall. Click on it to climb behind it and push it forward to make a bridge. Cross it and continue down the stairs and into the next room. Speak with Ariane to find out more about the history of the place as well as the magical vortexes that created chaos earlier in the quest. A circle in front of you will line up and you will need to attract a vortex into the circle using a spell like you did earlier so that Ariane can study it. 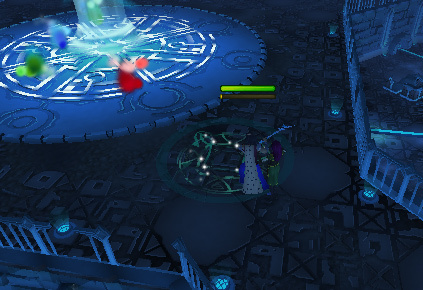 You can use whatever combat spell you want using the Mindspike weapon you obtained earlier. 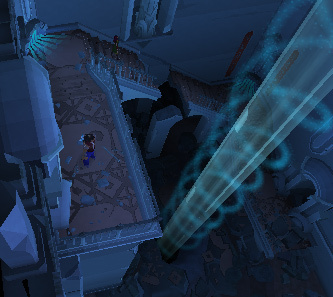 It turns out that the vortexes are made of soul fragments of old wizards placed into the power beam in the tower. An enchantment had kept them away but it's been removed. You will have to stop Sedridor from initiating his plan while Ariane restores the spell. Go back to the ground floor of Wizard's Tower and talk to Sedridor. He will ignore you, so play the organ four times to get the attention of the wizards. Sedridor will get angry and a cutscene of Ariane performing the enchantment will play. The wizards will finish the enchantment, unaware that it had no effect and that it was Ariane who actually saved the tower. Return to Ariane outside near the ruins and talk to her to finish the quest.